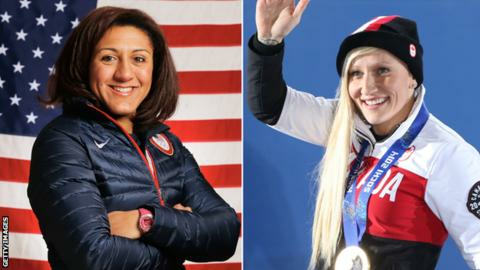 Canadian Kaillie Humphries and USA's Elana Meyers-Taylor made history by becoming the first women to win four-man international bobsleigh medals. Olympic champion Humphries, 29, piloted her three male team-mates to silver, with the USA team third, in the first of two North American Cup races in Calgary, Canada. Britain's Lamin Deen won gold in the second race, ahead of Meyers-Taylor. "This weekend was a step in the right direction," said Meyers-Taylor. The sport's international governing body [FIBT] only approved the participation of women in four-man competition in September. Humphries and Meyers-Taylor - who claimed silver at Sochi 2014 - need only compete in one further second-tier event in order to secure their place in the main four-man World Cup circuit. In the women's two-man events, Humphries won gold in the first race alongside Kate O'Brien, with Meyers-Taylor second alongside Garrett Cherrelle. British pair Mica McNeill and Sian Huxtable were third, continuing their impressive start to the season that included two medals in Park City, Utah, last week. Deen and his crew of Keith McLaughlin, Justin Oro-Campos and Andrew Matthews, will now head to Lake Placid, USA, for the season-opening World Cup races 8-13 December.